Research on the importance of vocabulary in learning to read as well as general success in school has been well documented for many years. “The importance of vocabulary knowledge to school success, in general, and reading comprehension, in particular, is widely documented” (Becker 1977; Anderson and Nagy 1991). The National Reading Panel (2000) believed vocabulary acquisition to be one of five main components in learning to read and comprehend. So if we want to equalize this achievement gap, one of the most important things we can teach are WORDS! Teachers often feel that Making Meaning Vocabulary lessons are easy. Our lessons take only 10 to 15 minutes a day and get students to use these words in actual conversations rather than the time old method of looking them up in the dictionary, copying the definition, and writing a sentence with each word. While this activity is rigorous (or just downright painful), research does not prove it to be effective. Our lessons use words from the previous week’s comprehension read-aloud trade book so that students have already met them in context. We review the section of the book in which this word was used, give a child-friendly definition, and have students use these words in sentences and activities as they turn and talk with their partner. Our simple but highly effective method is well documented in Isabel L. Beck, Margaret G. McKeown, and Linda Kucan’s Bringing Words to Life (2013). Not only are these lessons effective, they are fun—proving that lasting learning does not have to be painful. So if you want to excite students about words without being a nuisance or exhausting them, give our vocabulary lessons a try. 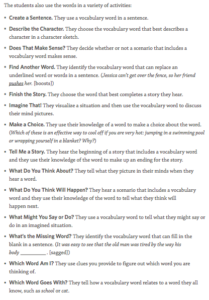 When students begin to use these words in their reading and writing, you will re-examine what rigorous vocabulary instruction needs to look and feel like in the hands of the learner. Becker, Wesley C. 1977. “Teaching Reading and Language to the Disadvantaged: What We Have Learned from Field Research.” Harvard Educational Review 47: 518–543. Hart, Betty, and Todd R. Risley. 1995. Meaningful Differences in the Everyday Experience of Young American Children. Baltimore: Paul H. Brookes. Hirsch, E. D., Jr. 2003. “Reading Comprehension Requires Knowledge—of Words and the World: Scientific Insights into the Fourth-Grade Slump and the Nation’s Stagnant Comprehension Scores.” American Educator 27, no. 1 (Spring): 10–13, 16–22, 28–29, 48. National Reading Panel. 2000. Teaching Children to Read: An Evidence-Based Assessment of the Scientific Research Literature on Reading and Its Implications For Reading Instruction: Reports of the Subgroups. Washington, DC: National Institute of Child Health and Human Development, National Institutes of Health.